Gamer's Gate is a leading digital distribution platform for video games, allowing customers to buy and download games, without the need for a physical disc. The company is based in Stockholm, Sweden, and Direct2Drive, Steam and Impulse are its closest competitors. Paradox Interactive gave birth to GamersGate in 2004 to provide easier and more efficient accessibility to Paradox's games via direct downloads. Trial operations began in April 2006, and the official launch of the system named "Gamer's Gate" happened on 20 November 2006. In 2008, the service was separated and run by an independent company called "GamersGate" after other publishers wanted their games distributed via the service. The initial offering in April 2009 was 1000 games, and the company grew drastically over the next few years, and by 2014, their offering had grown to 6000 games. Paradox Interactive, the parent company of GamersGate, reported that retail sales were overtaken by digital distribution, and that in January 2011, the digital downloads through GamersGate accounted for 70 percent of their total revenue. All the games offered can be downloaded from the website GamersGate.com, which is available worldwide. Here you can get discounts on your orders by using special GamersGate coupons. We list all the latest offers and deals here at Coupofy, so you do not have to waste time searching the web to find a coupon that will work. The website is displayed in English, but users can also choose to view it in Swedish. Currencies can be displayed in US Dollars or the currency corresponding to the country from which the user is accessing the site. One great feature of the website is the Game Tutor Program, where users can help each other out through difficult levels of games, as well as ask other game related questions. In-game chat functionality is also offered. 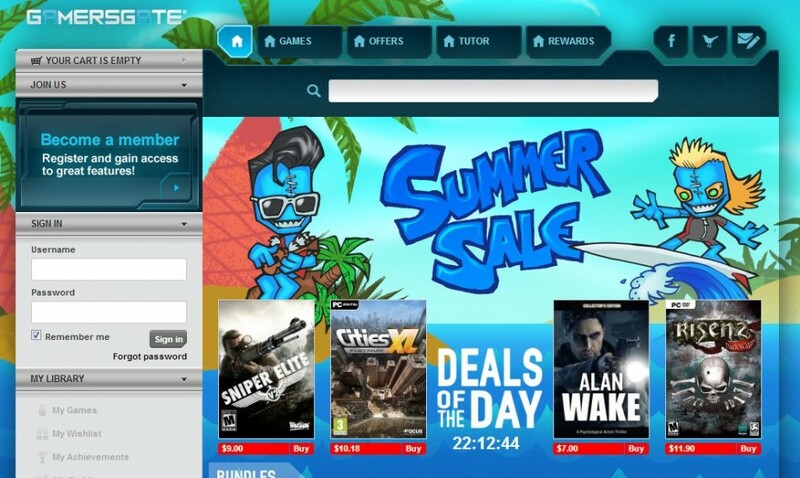 GamersGate's catalog for PC and Mac games currently contains over 6000 games which are available for download. Publishers include EA, Ubisoft and SEGA as well as other indie publishers. Games that are yet to be released can also be pre-ordered, and there is also a liquidation section for games that are on sale. All of the games offered can be downloaded through a simple and easy to use interface. Popular genres include Action, Adventure, RPG, Simulator, Casual, and Kids. Payments can be made via credit card, pre-paid card, or direct payments. Payment methods that are not available in certain regions will not be displayed when purchasing from those regions, allowing users to know exactly which payment methods are acceptable. Common non-card methods include Paypal, Blue Coins, Skrill and UKash. In order to redeem a GamersGate coupon code all you have to do is copy the code over from Coupofy and paste it in to the promo box before payment. If valid you should see the total order cost drop. GamersGate deliver all orders digitally, meaning you will need a steady internet connection to download your game file - many of which are hundreds of GBs. Your orders will be accessible from within your online account and there is no limit to the amount of times you can download the file. Some games however may have an activation limit, meaning you can't use it on more than one or two systems at the same time. So if you're planning to buy a new PC you should deactivate the game first. Due to content being available for download only, all payments made are final and non-refundable. If the user resides in the European Union, they will have the right to withdraw from the purchase for up to 14 days, provided that the download process for the game has not commenced. Obviously if you have used a GamersGate coupon you will only be refunded the actual amount charged to your payment method. @Lady_Oberon Hello! Could you DM us a screenshot of this?